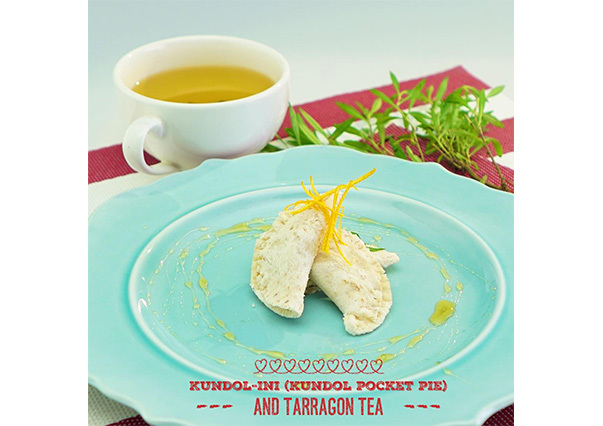 In a non-stick pan, simmer a cup of water and add grated kundol. Cook for about a minute or two over low-medium heat. Add honey and keep stirring until the sauce reduces. Toss in raisins. Add orange juice, rind and some cinnamon to finish. Let the mixture cool and set aside. Flatten bread using a rolling pin, make a pocket pie crust by trimming the edges and making round -haped bread with your ring mold cutter. Once the bread is prepared, fill it in with the kundol filling and bake in the oven toaster for a minute over medium heat. Boil water in a pot, and transfer in a glass with tarragon leaves. Add some honey as needed.